The diplomatic crisis around Qatar creates new hazards in the Gulf for Trump’s foreign policy team. Our Middle East foreign policy depends on strong, smooth relations among our Gulf allies. Now all cooperation is at risk. 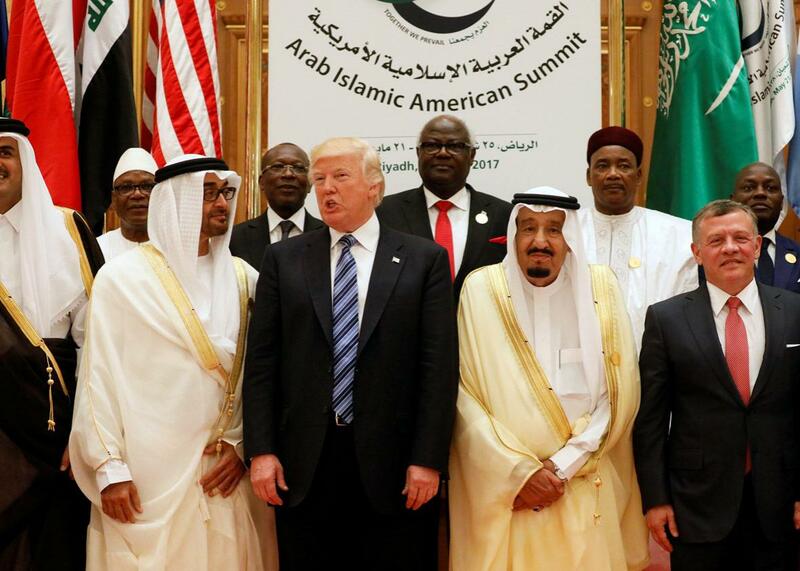 President Donald Trump stands with various Gulf state leaders during the Arab-Islamic-American Summit in Riyadh on May 21. The announcement Sunday night by Saudi Arabia, Egypt, the United Arab Emirates, and Bahrain that they would cut diplomatic relations and close borders and airspace to Qatar was the culmination of a long-running feud among the Gulf states. The surprising escalation of simmering tensions represents an embarrassing setback—and a formidable new challenge—for President Trump, who was in the region only two weeks ago proclaiming unprecedented success in unifying the Arab world against both Sunni extremism and Iranian meddling. Qatar has long been the black sheep of the Gulf Cooperation Council. With the start of protests across the Arab world in 2011, the Qataris supported Muslim Brotherhood–affiliated movements, while the Emiratis and Saudis viewed them as a major threat to regional stability. In Egypt, Qatar supported the the elected Muslim Brotherhood government of Mohammed Morsi while the other Gulf states supported Gen. Abdel-Fattah el-Sissi, who overthrew the Brotherhood and initiated a broad crackdown against it. In Syria, Qatar irresponsibly flowed weapons and money into the civil war with little vetting of opposition forces, leading to the rise of an extremist opposition. The Saudis and Qataris have also clashed on Iran. Saudi Arabia views Iran’s Islamic Republic as an implacable enemy, while the Qataris have always taken a more agnostic approach largely driven by the fact that they share a huge gas field with Iran. And despite their small size, the Qataris have attempted to punch above their weight in pursuing all of these policies—an approach that has chafed on their bigger neighbors. Still, the timing of the break is odd. The Qataris have joined Saudi Arabia and the UAE in the coalition to to fight the war in Yemen, and relations had been improving in the last couple of years. The proximate trigger appears to be a false report of an incendiary speech by the emir of Qatar, which was picked up by Saudi and Emirati media. Other reports have indicated that the Gulf states were furious with Qatar over ransom payments made to al-Qaida operatives and Iranian security officials to win the release of members of the Qatari royal family held hostage. But this does not explain why after years of tensions Saudi Arabia and Egypt have chosen this moment to break with Qatar. Another possibility is that the Saudis and their partners have been emboldened by the Trump administration’s anti-Iran and anti–Muslim Brotherhood worldview, which aligns almost entirely with their perspective and clashes with Qatar. But ultimately this decision seems to be first and foremost about regional politics—not about the United States. For the Trump administration, this represents a delicate moment. American air operations against ISIS in Iraq and Syria, and against al-Qaida in Afghanistan, are being coordinated out of Al Udeid Air Base in Qatar, where roughly 10,000 American troops are stationed. America has other major bases in Bahrain, where the Navy’s 5th Fleet is stationed, and in the UAE at Al Dhafra Air Base. Operations and access are not in any danger. But if the United States is investing this much in these three countries, it wants them to cooperate, which is very difficult for them to do when they’ve cut off diplomatic relations. More importantly, the Trump administration has made a major bet on aligning the Arab world against Sunni extremism and Iran. Administration officials have spoken about the possibility of an Arab NATO, and the president’s trip to Riyadh, where he met with the emir of Qatar and publicly called him a friend, was meant to unify Sunni Muslim countries against common threats. Just two weeks later came the most profound political schism that the Gulf Cooperation Council has experienced in decades. Though the Saudis, Emiratis, and Egyptians could justifiably argue that this coalition would be stronger if Qatar changes some of its problematic behavior. Already we are seeing possible effects. Iran is trying to take advantage by signaling that if Saudi Arabia cuts off food shipments to Qatar, it will try to supplant them. This, however, might be more talk than action, as it’s hard to see the Iranians being able to quickly launch such an operation. And indeed, the Gulf states are counting on the fact that their support is irreplaceable and will force the Qataris to change their policies. Iraq has issued a statement in support of Qatar, which puts Saudi Arabia and Iraq—two key partners in the fight against the Islamic State—at odds. Rather than a unified Arab world facing similar challenges, we appear to be seeing the exact opposite. For the Trump administration, the challenge will be to navigate this complex landscape and avoid a crisis that could undermine major presidential priorities. To do so will require a different approach to governing than what the Trump team has shown thus far. This is precisely the type of issue where senior government leaders need to leverage the career professional staff. The issues are complicated and weedy and require people who have been paying attention to the details for the past few years. Those people exist and are sitting in Doha and Riyadh furiously drafting cables with nuanced and informative analysis. Will anyone in Washington listen? Thus far, Jared Kushner has been Trump’s point man for dealing with the Gulf states without reaching out for much support from the professional career experts. Will he singlehandedly try to navigate the complex world of intra-Arab politics? Meanwhile, over at the State Department, will Rex Tillerson continue to depend almost exclusively on two aides—Margaret Peterlin and Brian Hook—for all of his information? Or will he actually engage with American officials in Saudi Arabia, Qatar, and the State Department’s Near East bureau and get their perspectives? This could be another major test for the new administration’s foreign policy team. Based on its performance to date (President Trump’s refusal to affirm Article 5, withdrawing from the Paris climate accord), there is little reason to be optimistic. We will have to wait and see how it handles a crisis that for once was not self-induced but could still have profound repercussions.